Suffolk is a great place to be a painter – or a dog. Merlin is our lurcher. I’m sure he is inspired by the wonderful place we live but in a different way. Walks are great but running is better. 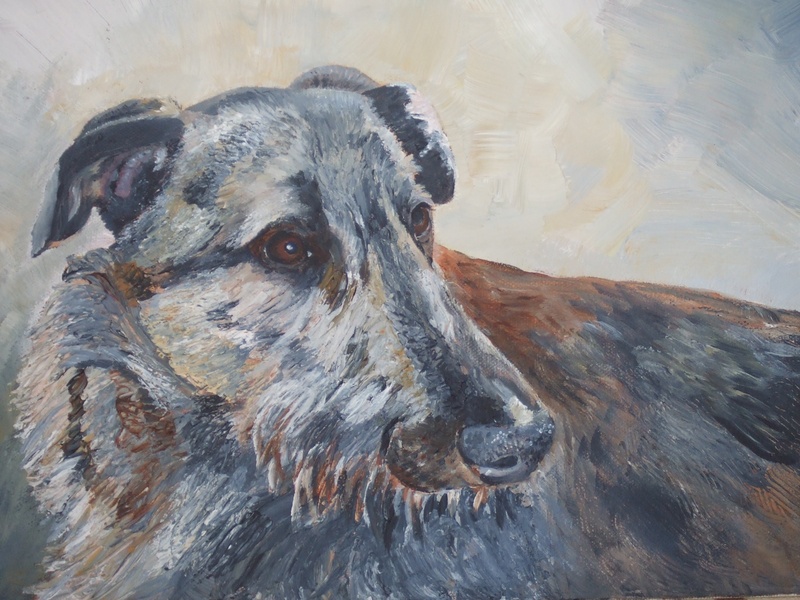 As far as he’s concerned hares are for chasing, not painting……. I am a “mixed media” artist. I always think that sounds a bit pretentious but, in my case , it means I use all sorts of materials combined with paint and ink. I hoard materials – magazine and newspaper clippings, hand made papers, old books, print – anything which can be transformed with paint and acrylic gels. I like the surprise element because you can never be sure how collaged paper will react with acrylic paint and inks. My pictures involve many hours of work spent cutting, tearing and sticking before and during painting. The paintings are about texture – you really need to look closely – and feel – to appreciate what I mean. Sometimes I paint “straight” acrylics (particularly for animal portraits) – with brushes and painting knives. I also use pastels, acrylics mixed with pastels and, occasionally watercolours. 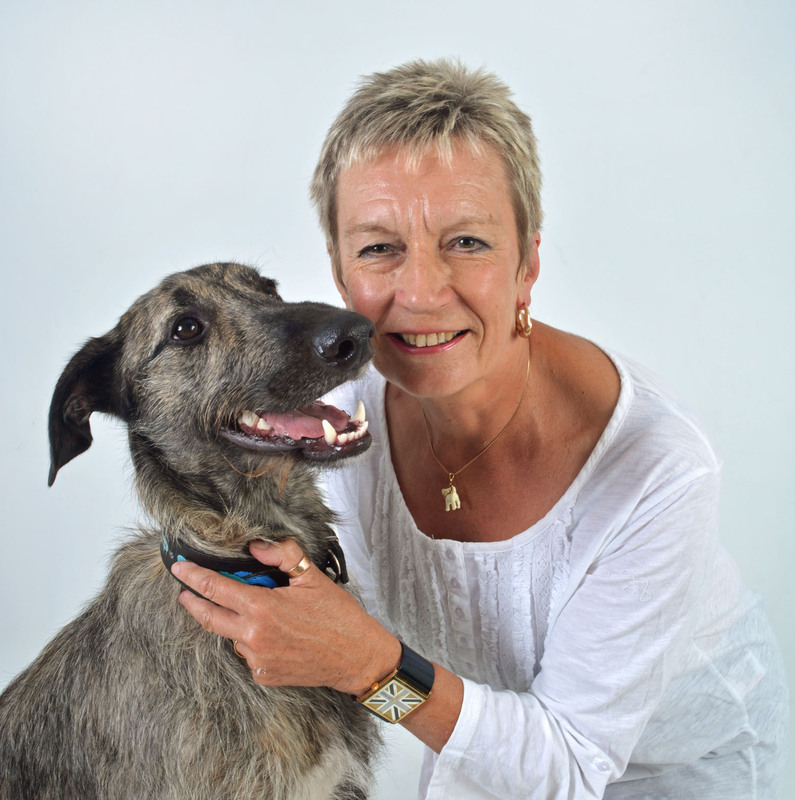 The Suffolk coast and countryside is my inspiration but my commissions have featured markets, chickens, a pub ….all with a slightly quirky angle…and Merlin often gets included somewhere – almost out of sight. 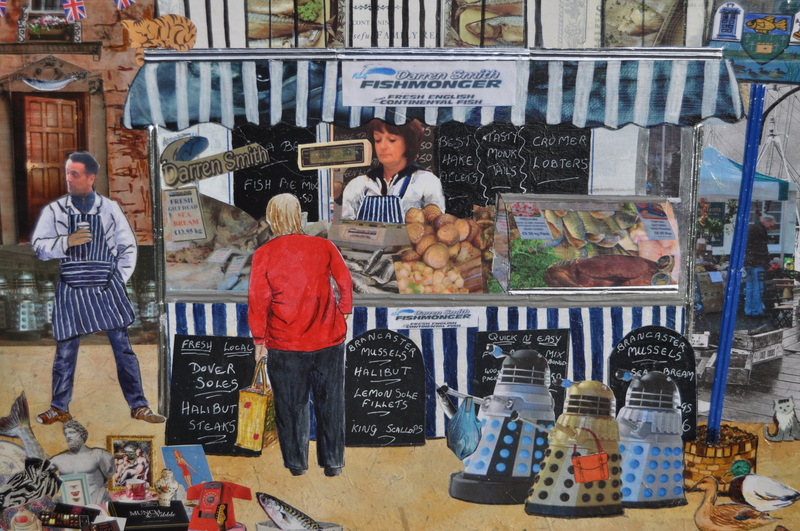 One commission has tended to lead to another and I have been asked to “personalise” pictures – the places are recogniseable but I don’t suppose Daleks often queue at the fish stall in Framlingham Market! Take a look at my galleries. I hope you’ll see something you like. Please email or telephone me if you want to enquire about the availability, price or anything else about my work.